We are for low-income pet owners who qualify based on eligibility (click on Pricing & Eligibility above right). If you do not qualify, click here for other resources that you can use for low cost spay/neuter. Already Scheduled? Get Your Post-Op Info Here. SNAP's Neuter Scooter is a fully equipped mobile spay/neuter unit. 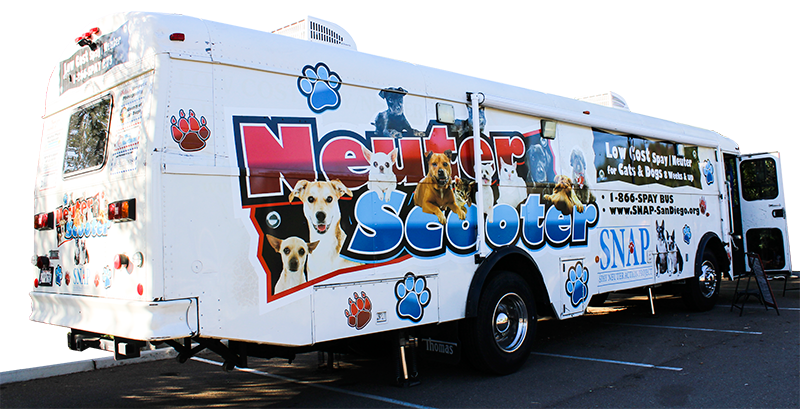 It travels to neighborhoods where spay and neuter services are most needed in the Greater San Diego area. All SNAP surgeries are performed by a CA state licensed veterinarian. 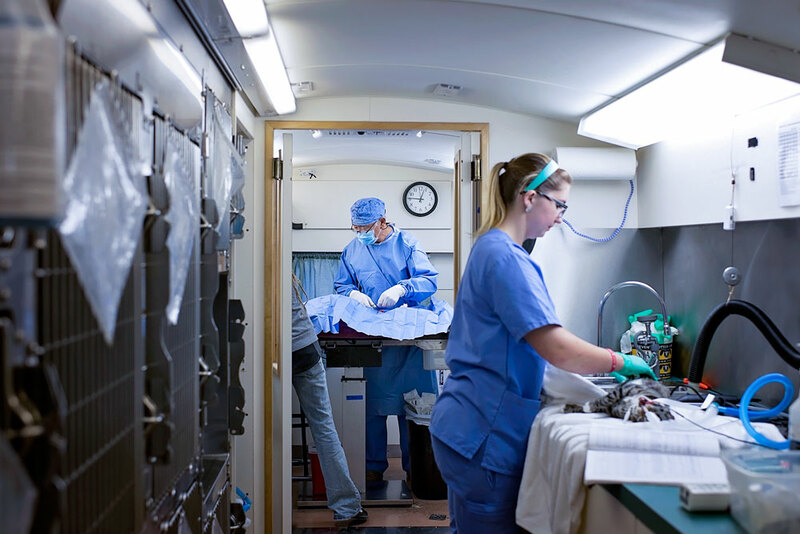 On board the Neuter Scooter, we have built-in kennels, a surgery table, 3 anesthetic machines, an autoclave and other necessary surgical equipment. For the comfort of the animals, our bus is air-conditioned and heated. We've invested in a top-of-the-line team to assist our veterinarians. Your pet is in great hands! 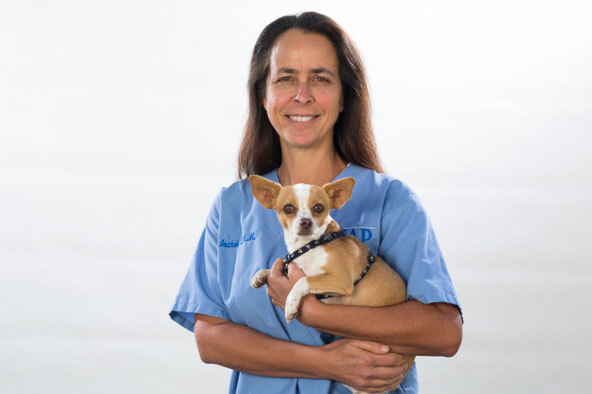 "We bring low cost spay and neuter services to help low income pet owners of the greater San Diego community!" SNAP's Neuter Scooter Bus is a full-service mobile veterinary clinic. We are providing affordable spay and neuter surgery to the dogs and cats belonging to San Diego pet owners, who may not be able to afford their private veterinarian for this beneficial surgery. serving the Greater San Diego area. We have a fantastic team of CA state licensed veterinarians specializing in spaying and neutering cats and dogs. *Deposits made here with SNAP scheduler recommendations only. Q: How long does it take for "check in" on the morning of the clinic? Check-in can take approximately 30 minutes. We work hard to ensure that the process runs smoothly and efficiently, but please understand that there may be circumstances in which it could take slightly longer. Q: What does a "stand-by" appointment mean? A “stand-by” appointment does not guarantee that your pet will be seen on that day. We make every effort to fit in stand-bys through cancellations, rescheduling, and clients not showing up for their appointment on that day. Stand-by pets are also admitted to the bus based on their size and the appropriate recovery kennel space. Q: Do I need to come back to have stitches removed? No. The outer skin layer is held together with a dissolving surgical glue. Water or licking can dissolve the surgical glue. Q: What will I need to do when I get my pet home the day of surgery? When you pick up your pet after surgery, you will receive post-operative instructions. If you would like to preview those instructions in advance, they are posted on the website.